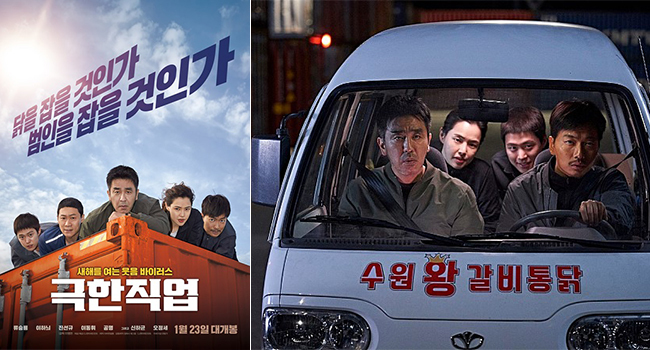 Korean fried chicken chains are enjoying a windfall from the blockbuster movie “Extreme Job” (Geukhanjikeob in Korean), an action-comedy about police going undercover in a fried chicken delivery shop. The movie has broken the 10-million milestone in ticket sales as words got around about the hilarious episode of die-hard police taking chicken business more serious than their real job. The fried chicken dish appeared in the film was supplied by the country’s leading fried chicken delivery franchiser BHC Co. A company official said that the specific fried chicken, flavored with special galbi (sweet soy sauce, garlicky taste) marinade, has been one of the company’s best-sellers since the launch in 2017. The company has seen sales of the fried chicken dish rise since the movie has become a hit, said an official from the company. CJ Entertainment, the distributor for Extreme Job, has posted the recipe for the galbi-flavored fried chicken on its social media channels to respond to the explosive demand for the dish. The fried chicken eatery in Suwon, a city south of Seoul, where the movie was filmed also has added the galbi-flavored fried chicken back on its menu that it had taken off two year ago due to slow sales.